The ORIGINAL style hardtop is normally only available fully fitted. Typical cost for this is around £2400. This earlier version of the hardtop doesn't lend itself to DIY assembly and is best being fully fitted at the workshop in Halifax. It can be both painted, or covered in canvas to look like a soft top. The new MALAYSIAN hardtop is for painting only and is available either fully fitted and also as a DIY kit of parts (Current cost for the kit is £1895.00, Usual cost to fully fit and paint is between £695.00 - £895.00). This newer version of the hardtop has been specifically designed with DIY fitting in mind and is simpler to fit than previous versions, requiring no special tools or procedures. The DIY kit is made up of 10 separate fibreglass pieces (pictured) and comes with a large amount of pre-assembly work already carried out, leaving only the final jobs to be finished on the car. The DIY kit of parts is finished up to the primer stage (grey 2-pack primer as standard) and pre-trimmed on the internal surface in lightweight black acoustic cloth. The 'B' and 'C' pillar support pieces are painted matt black and come pre-bonded into position with their relevant catches / hook plates attached. The rear window comes pre-bonded in place along the top and down both sides. The lower edge of the rear window is deliberately left un-bonded - the hardtop will need to be set-up on the car first and be tensioned down properly on it's catches before the lower edge of the rear window is bonded to the aperture. This method allows the lower edge of the fibreglass hardtop to conform perfectly to the deck shape of the car before the window is bonded to it - avoiding the rear window being stressed. After clamping the hardtop to the car, the side flanges (where the header rubber sits) need to be ground down to suit the door windows - this will determine the pressure on the rubber when the door is closed onto it. The hardtop side windows are supplied ready to fit with the black border pre-applied, and will need bonding in place on final assembly to be flush to the door windows. Two 'Top Hat' section mountings will need bonding to the underside where the roof struts connect - supplied with their mating faces pre-treated ready to bond. Full assembly instructions and pictures are included, as well as any additional help and advice either via email or phone. To avoid excessive packaging and carriage costs DIY customers would need to collect the kit parts from the workshop address. The hardtop installation is done in a such a way as to make reverting back to the standard soft top set-up quite simple if desired - giving the option of both hard, and soft tops, for winter / summer use. This involves leaving the Velcro in place on the top of the rear wings (previous hardtop versions involved fully removing the Velcro) and other minor details necessary for easily refitting the soft top are retained. The total time to revert back to the soft top is estimated at around 30-45 mins without rushing, and will involve simply unbolting the Deck Finisher Panel (the mounting panel for the quick release catches) re-bolting the folding soft top onto the side pivots, reconnect the interior lamp wiring, and re-bolting the aluminium roof struts to the underside of the folding soft top header. Chimaera's up until around 1995 have the rear edge of the original TVR folding soft top (directly under the rear window) bolted down vertically into the top of the rear deck with hidden bolts underneath the canvas and nuts accessed from up inside the boot (instead of being bolted horizontally with with the fixings accessed from inside the cabin). This causes a row of bolt holes to become exposed on the top of the deck when the soft top is fully removed from the car. The solution is to fill in the holes and apply a neat black border around the top edge of the rear deck to disguise them. This also has the advantage of disguising any unsightly masking edges that may also be found when the soft top has been fully removed - which may be the case if the car has had previous paintwork to the rear wings with the soft top masked up instead of being fully removed. The black border solution kills two birds with one stone. Chimaera's up to around 1998 have a boot hinge design that restricts the opening height of the boot lid. To allow much easier storing of the hardtop panels the boot hinge conversion shown in the TVR / GRP Projects section is recommended for earlier Chimaera's. Simply fitting a longer gas strut on the boot lid may strain the original hinges beyond their limit and may also cause the rear edge of the boot lid to foul the rear roof area so be cautious of this. This conversion isn't necessary on later cars as TVR altered the design of the boot hinges from around 1998 onwards to allow the boot to open almost vertically. Typical turnaround time, for a vehicle brought on-site for fitting, for both versions of the hardtop would be in the region of 3-4 weeks (depending on existing workload) including final prep / paint, and drying time. Some difficult or specialist colours may require aditional time / cost. In rare cases some colour formula's may no longer be available so it's worth checking first. Up until recently, the replacement targa panel included in the kit would have required new metal retaining channels to mount the new targa seals, however, these metal retaining channels are now obsolete meaning that a different sealing methods has needed to be found (although the targa sealing rubbers are still readilly available). 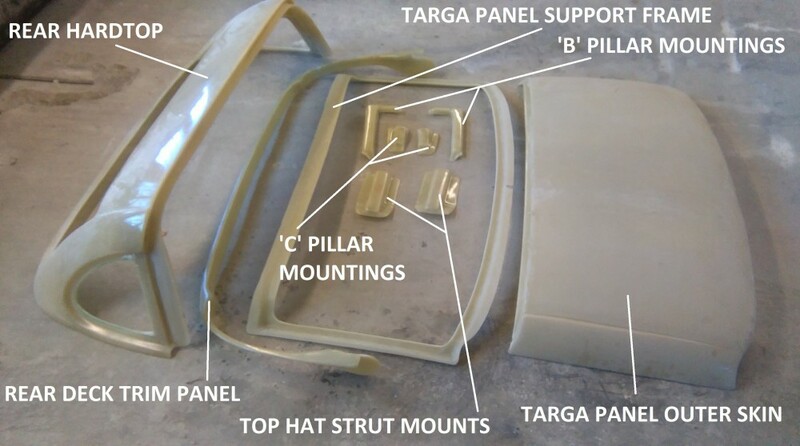 To avoid having to reuse the channels from the original targa panel (and render the original targa panel useless in the case of retro fitting back to the soft-top set-up) a new sealing method has been developed and all hardtop conversions will now include the new arrangement. The new sealing method involves a custom-made fibreglass retaining channel into which a new profile of sealing rubber fits into, before being sealed in place. The retaining channel is fully adjustable for height and angle to achieve the best possible weathertight seal to the door windows during initial setup, and is then sealed in place to prevent any movement. All hardtops are built to order. The DIY option includes everything needed to complete the installation except vinyl trim material which will be needed to cover the rear deck finisher to match the door tops. Consumables such as contact adhesive, etc, not included.